Thursday, January 24, 2019. 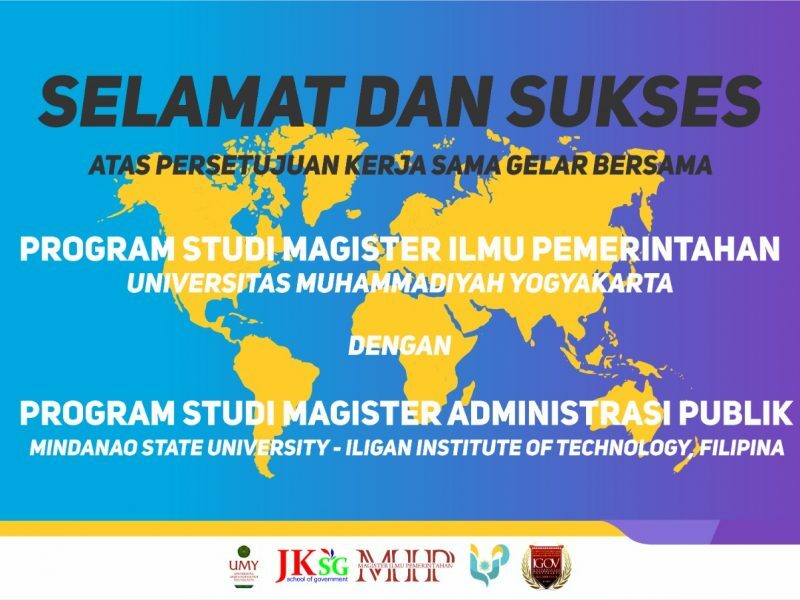 Joint Degree Program between Master of Government Affairs and Administration (University of Muhammadiyah Yogyakarta) and Masters of Public Administration (Mindanao State University) is ready to held in the Even Semester Academic Year 2018/2019. This Joint Degree Program is a follow up to the Memorandum of Understanding (MoU) between the two Institutions dated September 19, 2015. This campus, commonly referred to as MSU-IIT, is a higher education and research institution located in Iligan City, Philippines which was integrated as the first autonomous unit of Mindanao State University System in 1975. In the Program, students took 21 credits in the year first at UMY. In the second year, semester 2 and 3 students carry out lectures at MSU-IIT (Philippines) and must take as many as 18 credits. Furthermore, students complete thesis research in the fourth semester with 6 credits.